How to make a Black Hole... Cupcake! There is great argument about the existence of black holes. The term "black hole" is often used as a metaphor to describe a place of emptiness or loneliness, which stems from its actual scientific meaning. According to NASA, "a black hole is a place in space where gravity pulls so much that even light cannot get out. The gravity is so strong because matter has been squeezed into a tiny space." Though black holes form from dying stars, when a hole is created no light is emitted which causes it to simply look black. Nevertheless, regardless of your position or understanding of these matters of quantum mechanics, if you are a Chocoholic or a lover of chocolate by any means, the black holes that I have created are ones you can believe in! It was last summer, when a friend asked me to bake some cupcakes for dessert at her barbeque that I created my first black hole cupcake. 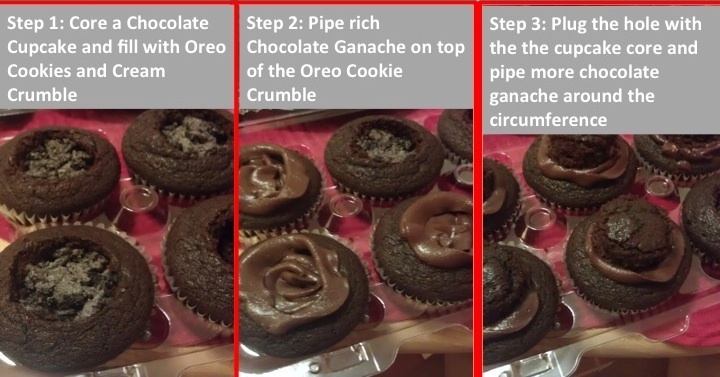 Being the Sweety (the term she uses to describe her love of sweets) and Chocoholic that she is, I was commissioned to concoct a chocolate cupcake, stuffed with oreo cookie crumble and chocolate ganache. With all of the rich chocolatey goodness and the black color of oreos filling the center, what else could I have called this cupcake? Want to learn more about "real" black holes? Go here !